I usually bake my cheesecakes 1 1/4 hours or until edges are light brown and center is almost set. I then turn the oven off and let cheesecake stand in oven, with door ajar, 30 minutes or until center is completely set. Then remove from oven and cool completely on a wire rack. Ingredients: It is important to use room temperature ingredients, such as the cream cheese and eggs. To bring cream cheese to room temperature, quickly, place completely unwrapped package(s) in a microwaveable bowl. Microwave on HIGH for 10 to 15 seconds or until slightly softened. NOTE: Do nor let the cream cheese melt or get warm. Refrigerate if it does. Easyer to just leave you cream cheese out of the refridgerator the night before. Eggs: When mixing the ingredients (especially the eggs) together, beat at medium speed just until smooth. Add the eggs, one at a time, on the slowest speed possible and scrape both beater and bowl. You want to avoid beating air into the mixture. Too much air will make the cheesecake fall. Over beating can also cause cracks to form in the cheesecake as it bakes. Cheesecakes are egg based, and they need Low heat. Wrap aluminum foil around the out side of your pan to help even the cooking tempuature. Place your pan cheese cake into another pan of room tempurature water so as the pan sits in the water about a half to three quarter inch, place pans in the center rack of the oven, carefull not to splash the water on top of the cheese cake. Springform Pan: Lightly grease (butter) the inside of the entire springform pan. This is to help prevent the batter from creeping up the side and then falling. You can even cut a piece of parchment paper (the same size as the bottom of your springform pan) and place on the bottom of the pan. Definition: The springform pan is a two-piece pan that not only has sides that can be removed but the bottom comes out too. There is a round base and an interlocking band, usually 2 to 3 inches high, that forms the sides, opening and closing with the flick of a latch. The pan pieces are assembled for baking, and then, once the contents have cooked and cooled, the band is opened and removed. Because the cake remains on the pan’s base, the springform is perfect for cheesecakes. Baking Cheesecake: Do NOT open the oven door during the first 30 minutes of baking. Drafts can cause a cheesecake to fall or crack. Do not jar the cheesecake while it is baking or cooling. How to prevent cracks in your cheesecake: When the internal temperature of a cheesecake rises beyond 160 degrees F. while baking, it will always crack. To prevent this from happening, use an instant-read coo king thermometer to test its doneness. When the cheesecake is done cooking, reaches 150 degrees F., turn the oven off. Let cake stand in oven, with door ajar, approximately 30 minutes or until center is completely set. Remove from oven and let cool cheesecake completely on a wire rack before refrigerating. This is the type of cooking and meat thermometer that I prefer and use in my cooking. I get many readers asking what cooking/meat thermometer that I prefer and use in my cooking and baking. I, personally, use a digital thermomiter shown in the photo on the right. To learn more about this excellent thermometer and to also purchase one (if you desire), just click on the underlined: Thermapen Thermometer. How to tell when cheesecake is done cooking: The cheesecake is done when center is almost set, but jiggles slightly when gently shaken. For a perfect cheesecake, use a cooking thermometer and take it out of the oven when the cheesecake reaches 150 degrees F. at the center to avoid over baking. Expect a slight shrinkage as it cools. If there is great shrinkage, you have baked it at too high a heat. Resting Period: Let the cheesecake rest in the oven 15 min. Unless other directions are specified in the recipe, when the cheesecake is done, turn off the oven and open the door. Cooling Cheesecake: Cool cheesecake slowly and competely before refrigerating I usualy wait about an hour so it's not warm on the bottom. Chilling a warm cheesecake will trap condensation in the cake and make it soggy. 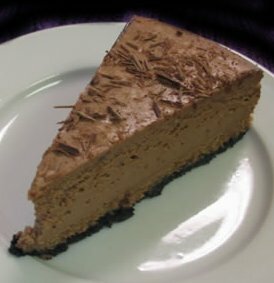 Cheesecakes always need to be well chilled before serving, preferably 12 to 24 hours before cutting (the cheesecake will solidify to a perfect consistency during this time). Removing from Springform Pan: Slide a small knife around edges of cake to loosen it and remove sides of the springform pan; transfer onto a cake plate.